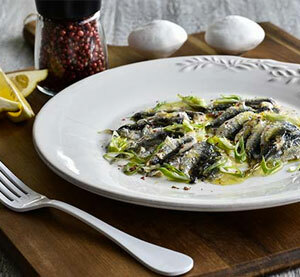 Slice and clean well the sardines; place fillets on kitchen rolls to absorb unnecessary water. Place the sardines with the skin facing upward in a shallow baking tray, lined with greaseproof paper. Pour the olive oil over the sardines, sprinkle with salt and bake for 2-3 minutes in a preheated oven under the grill, setting the oven rack on the upper third of the oven. When the sardines are ready, remove them from the oven and place them on a plate; add the white balsamic cream with orange & lemon, the finely chopped spring onions and the lemon zest. For a finishing touch, sprinkle with freshly ground pink pepper.